For the 34th consecutive year, the staff at Printing Impressions has compiled the Printing Impressions 400 list of the largest printing companies in the United States and Canada as ranked by annual sales. Once more, Velocity Print, a leader in print, promotional products, and fulfillment of marketing asset essentials, would like to recognize and thank the staff of Printing Impressions on their acknowledgement and inclusion on this respected list. 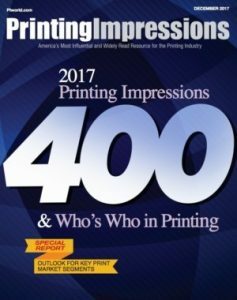 The 2017 Printing Impressions 400 & Who’s Who in Printing.